in the great reply he provided! I hit two jackpots with my latest reply from pitcher Bobby Shantz. I shared my first letter from Bobby on the blog back in 2010. I wanted to know how he felt about autographs today, nearly a half century after leaving the mound. I get around 50 or 60 autographs [request letters] weekly. On why he never stopped signing? Bobby was more than kind pointing out that I hadn’t remembered his career exactly. Too quickly, I referenced his hitting record, believing that his first HR was off Harry Byrd in 1954. “It was my brother Wilmer, who hit the home run off Harry Byrd, with the bases loaded, not me. I did hit one home run off Allie Reynolds in Yankee Stadium. Allie later told me I was too damn little to him a home run. HA! Thank you, Bobby. We will always remember you! Coming Wednesday: Stay tuned Yankees fans for a book review of The Juju Rules! Bobby is one of the best in the hobby! 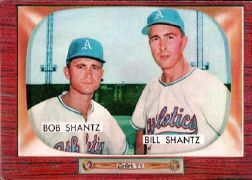 Love some Bobby Shantz. Truly one of the greats, and a true gentleman as well! Fifty to sixty per week?! What a gentleman.